The view of the Broad Street Bridge that hangs over Roosevelt Boulevard. Motorists should be prepared for traffic congestion in the foreseeable future as construction commences this week on a major thoroughfare in Philadelphia. 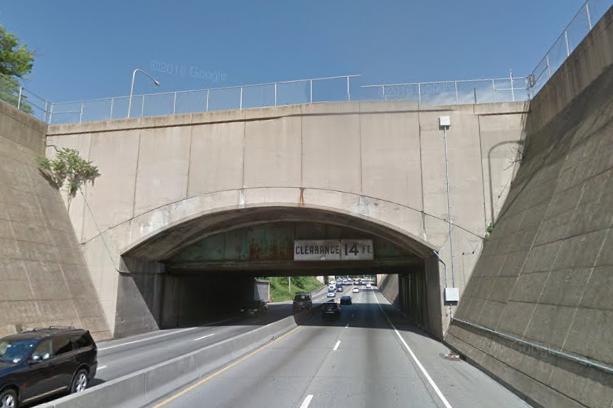 The Pennsylvania Department of Transportation (PennDOT) announced that crews will begin a two-month project Monday on the Broad Street (Pa. Route 611) bridge that hangs over the Roosevelt Boulevard (U.S. Route 1). The $400,000 project was financed entirely with state funds. The work will affect traffic patterns along Roosevelt Boulevard during construction. Lane restrictions will be in effect on the express lanes in both directions from 9 a.m. to 3 p.m.
Workers will install a new perforated pipe to improve the bridge's drainage system. A subsurface drainage system will also be installed to collect water, PennDOT said. The 88-feet long, 113-feet wide bridge was built in 1961 and currently carries an estimated 31,303 vehicles daily. The Broad Street Bridge is one of eight bridges in the greater-Philadelphia region included in the $7.5 million project. Only two other bridges still need to be repaired: The Bryn Mawr Avenue Bridge over Ithan Creek in Radnor Township, Delaware County and the New Second Street Bridge over Tacony Creek in Cheltenham Township, Montgomery County. Construction on the Broad Street Bridge is expected to be completed in late January 2017.